By the middle of the sixties, the CompaÒia Trasmediterrànea decided to build four ships destined to give service of the Baleares and Canary Islands (the Albatros sisters). Two of these ships were delivered by Unio'n Naval de Levante: "Juan March" (1966) and "Las Palmas de Gran Canaria" (1967), and the others two were built by Soc. EspaÒola de ConstrucciÛn Naval: "Ciudad de Compostela"(1967) and "Santa Cruz de Tenerife"(1966). These ships were equiped with air conditioning, Denny Brown stabilisers and spacious external decks, with included pool. They could transport 500 passengers in cabins, 250 in armchairs and 100 cars. Outwardly she highlighted their slender bow mast, their two funnels (with clear influence of the Canberra) and their central dummy funnel that hide a bar. These ships don't have stern ramp and the car access was carried out through lateral doors. They could not transport trucks, and that limited their use subsequently. The machinery consist of two B&W two stroke diesel engines of 8,000 b.h.p., and each driving a cp propeller for a service speed of 21 knots. Also has a KaMeWa bow thruster. They were trading in the lines Valencia-Palma of Mallorca, Barcelona-Palma of Mallorca, and Barcelona-Canary Island until 1975 (with all passage in cabins). In the last seventies, they were relegated to secondary lines for the new ferries of the Canguro and Tiburon series, in order to be only used like relief ships in the first eighties. They also served in order to cover new routes: the "Ciudad de Compostela" sail from 1982 Sete-Palma de Mallorca-Ibiza crossroad, that only was carried out in summer months. In 1985, the CompaÒia Trasmediterranea decided come off the four sisters: three was sold for further trading as ferries, and the "Las Palmas de Gran Canaria" were sold to MarÌtima Albatros (a consortium of spanish owners), in order to be refurbished as a cruise ship. The Santa Cruz de Tenerife was sold in 22/1/85 to Sun Mediterranean Lines Ltd. Limassol for $1,6 million, for ferry trafic in the Eastern Mediterranean as the Sol Oympia II. She suffered a minor engine room fire 22/04/86, when she was on route to a Perama Bay yard for repairs prior to delivery to Indian owners. When in drydock at Eleusis Shipyard, a fire broke again the 6/6/86 and the ship became a constructive total loss. The hull was sold to Nigdeliler Hurdacilik ve Makira Ticaret A.S., a turkish breaker, having left Piraeus in tow 21/09/87, and arrived al Aliaga 26/09/87 for demolition. The last Albatros sold by Trasmediterranea was the Ciudad de Compostela. Until 1992, she was the relief ship of the fleet. That year, she was sold to Libton Shipping Ltd, Malta, and became European Star. In 1994, she was remaned Saray Star for the same owners. She had a galley fire 10/6/94 when she was about 28 milles north of Cephalonia during a voyage from Piraeus to Venice. All the passengers and crew left the ship and later the fire spread through the accomodation decks and she sank 13/6/94. Transformation of the garage deck in cabins and public spaces. Modernization of the internal decoration and external look of the ship, with the construction of a three deck atrium. Change of auxiliary engines and installation of new sanitary, communication and navigation equipment. 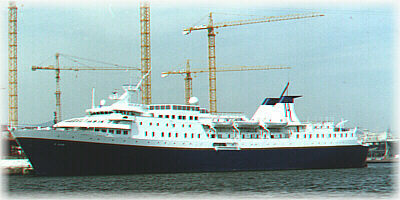 In 1988 was delivered again as a modern cruise ship (9.725 grt), under the name Crown del Mar. She was able to transport almost 400 passengers in 188 cabins. The mast and the funnels had been changed for another more raked, which improved their external look (many think that is somewhat angular). Her hull was painted white with some dark lines. The ship was sent to the Caribbean under the panamanian flag in order to carry out cruises from Palm Beach, chartered by Crown Cruise Line. The delivery of the new Crown Monarch by Unio'n Naval De Levante and problems between the owners made that the ship returns to Spain in late 1991, remaining laid up in Barcelona during almost four years. In 1994, she was sold to their original owners, Cia. Trasmediterranea, that after maintaining some fruitless conversations during a year with Carnival Corp. had decided to venture in solitary in the cruise world. The ship was towed to Cartagena yard of Bazàn Carenas, where she suffered a $5 million refit, dedicated mainly to the renovation of the interior spaces. The superstructure was also enlarged towards the bow., like in the Seabourn ships. Also, her hull was painted blue. A new company, (subsidiary of Trasmediterànea) Royal Hispania, was created to manage the ship, that was renamed D. Juan. Now, she follow navigating under that name (mainly with spanish customers) in weekly Mediterranean cruises starting from Barcelona. In winter months, she cruises in the Canary Islands. The other three sister ships of the series were sold to Greek owners. 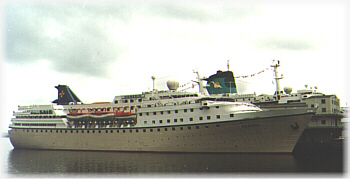 The Juan March was also sold in 1985 to the same owners, which renamed the ship Sol Christiana. 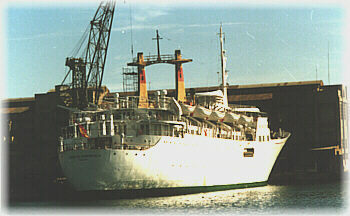 In 1986 she became the Kypros Star for Opal Lines,and placed on a run from Piraeus to Alexandria. In 1989, she was newly sold to Shipping & Commercial Corp. and renamed Ocean Majesty, in order to be converted in a cruise ship. This reconstruction is one of the most extensive ever undertaken in Greece yards, it was carried out by Chios Breeeze Marine Co. and lasted from 1989 until 1994, because work are slowed waiting for a charter. Eliminate the old superstructure and car decks, and starting from the original hull. shafts and propellers, rebuilding the vessel. Building a new superstructure, including bridge and pool, and construction of 273 cabins, with 535 lower beds. The ship was re engined with new Wartsila 16V32D diesels, and four Wartsila 6R32 auxiliary engines. After the works, the ship (10.417 grt) has a pleasant profile, but its built-up stern is not beautiful. She carries almost 150 passenger more than the D.Juan, so that it became a high density vessel, with open deck and sunning space limited. Her first charter was for another greek owner, Epirotiki, who renamed the vessel Olympic in 1994. In 1995 she was chartered by the british operator Page & Moy. The arrival from the old Carnivale to the Epirotiki fleet meant that the Olympic name go to their prow, while the chartered ship become the Homeric. Last year, the ship sails like Ocean Majesty for several operators, and for this year, she was chartered by Orient Cruise Lines for a series of Aegean cruises from Piraeus. During any time, it was commented that she was going to be chartered on the french operator Nouvelles Frontieres during two years. The two surviving ships of the series are a tribute to their designers and builders, and given the depth of the rebuilding suffered by both, probably they navigating until well entered the 21 century.